Surrealism is an artistic journey into dreams, into fear, and into nightmares, where the best works can be visually and aesthetically pleasing and still scare the viewer subconsciously. While I’m familiar with the Surrealist works of René Magritte, I’m not as versed in the works of other Surrealists. “The Surrealists: Works from the Collection” is located in the Philadelphia Museum of Art’s (PMA) Perelman Building and runs through March 2. This exhibit was thus a journey for me to discover how I would respond to a range of Surrealist artists and their works. The exhibit is chronologically organized, featuring works in a variety of media by different Surrealist artists from all over the world. The exhibit covers Surrealism’s origins in Paris in the 1920s, its spread across Europe in the 1930s, and its transatlantic journey to the United States in the 1940s. As I entered the exhibit, I had to put myself in the right frame of mind. I expected some of the works to shock me, even frighten me. Could I gain a glimpse into the strange minds that produced these works? The first pieces on display function as a sort of summary of what the rest of the show covers: the works are arranged in a corner by the entrance and span several decades. The most recent of these pieces is Canapé en temps de pluie (Rainy-Day Canapé), an evocative sculpture from 1970 by Dorothea Tanning. This remarkable work (seen above), an immediate highlight of the exhibition, takes the form of a sofa completely covered in a tweedy upholstered fabric. Yet under the fabric are entwined stuffed, almost human-shaped forms. 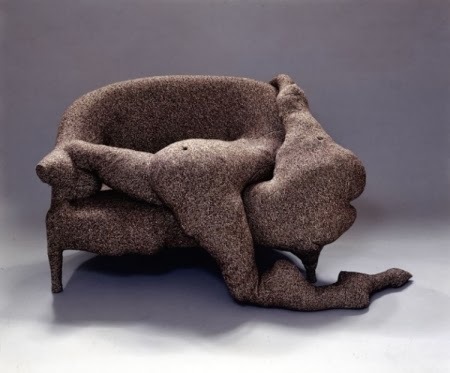 It is as if the artist has covered two limp, twisted human bodies with the same piece of upholstery as she has covered the sofa, binding them together under the material. Once I saw it in this way, the effect was almost horrifying. The work is completely unforgettable. 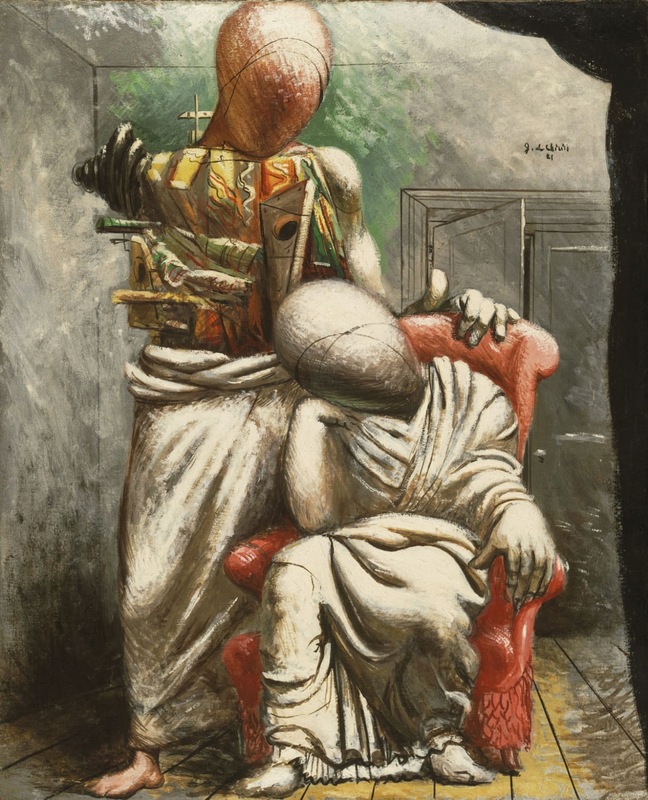 Moving onto the main body of the exhibit, I was greeted by several enigmatic paintings from the 1910s by Giorgio de Chirico, an Italian artist who predates Surrealism but is one of its greatest influences. Two distinct styles of his works are displayed here, yet they both address similar themes involving interactions between Classical and more modern elements. The first style is exemplified in The Soothsayer’s Recompense, which combines a Classical sculpture with a lurking element of modernity, in this case a train, whose steam is visible from behind a brick wall. This genre of his works takes place in a world outside time, in a fictitious isolated, empty space. The other style of his work, represented here by Victorious Love and The Poet and His Muse, consists of humanoid figures in Classical drapery with strangely smooth, bland faces that look like carved wooden eggs. The figures seem both alive and dead, both classical and modern, and altogether creepy. Surrealist paintings take a good deal of effort to parse, and even then we are not sure we've understood their meaning. When the forms are abstract, their message is anyone’s guess, but even when the subject matter is figurative, there’s enough of the unreal or twisted about them to inspire wonder and confusion. There is quite a bit of photography in this exhibit, which I found interesting. I often don't think of photographs as something that have the same elasticity and receptiveness to the Surrealist idiom as do paintings, sculptures, or drawings. Yet some of these black and white photos, especially The Enigmatic Figure, a 1938 gelatin silver print by Clarence John Laughlin, match their painted brethren’s mystery and subconscious horror. The photograph in question depicts a half naked woman in a window, her face covered with hair, seeming to watch us from inside a house even as we cannot properly see her. The Enigmatic Figure reminded me of the latter category of de Chirico’s paintings because with both works, the viewer cannot see the faces or the eyes of the subjects. The eyes, traditionally speaking, are the windows to the soul; they are often how we engage with figures in a work that appears to be or that we recognize as human. With no eyes, the viewer feels pushed out of the work, left with no path into the world of the work, and must settle with gliding along the surface of the work without dialoguing with the subject. Some of the most tactile and downright creepy Surrealist paintings on display are the several by Salvador Dalí because of the way he uses texture in often confusing contexts. 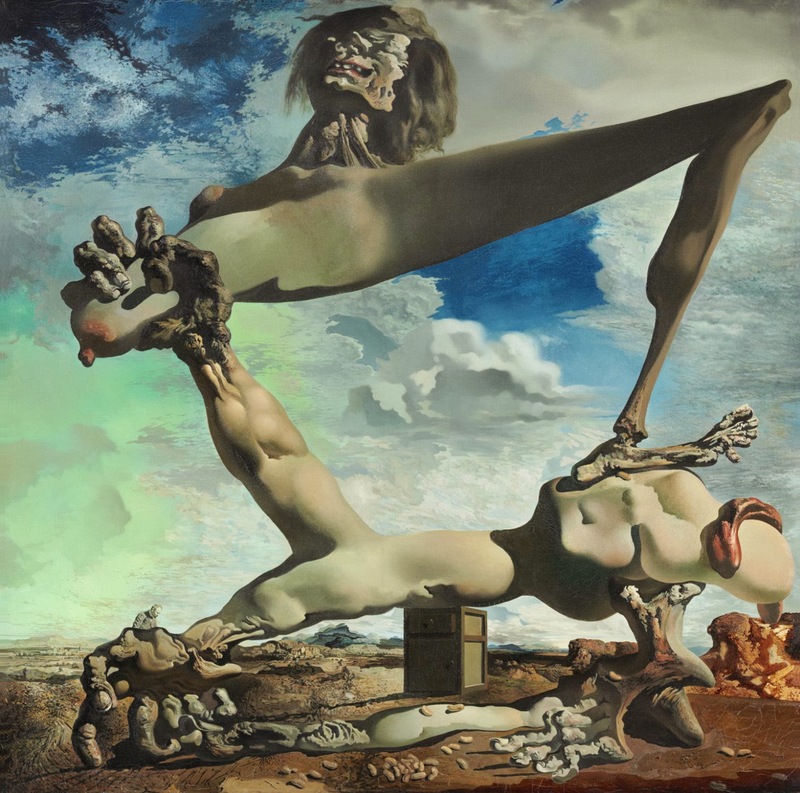 Dalí’s Soft Construction with Boiled Beans (Premonition of Civil War), from 1936, is a good example of this aspect. Much of this painting is given over to a fleshy shape with recognizably human skin, with all the slightly shiny sheen and stretchiness of human skin, yet the form the skin is draped over is decidedly not human—it’s something out of a strange dream. In the back room, a final highlight is The Bachelors Twenty Years Later (1943) by the Chilean Surrealist artist Roberto Matta. The work, painted in oil on canvas, is inspired by the PMA’s own Marcel Duchamp masterpiece, The Bride Stripped Bare by Her Bachelors, Even. Matta’s response is like looking straight through Duchamp’s glass sculpture. It depicts abstract forms—circles, lines, black blocky shapes—interacting on a wonderfully textured ground of gray and white, all mingled with gold and red. After viewing this satisfying exhibit, I realized that Surrealist artworks don’t talk to the viewer in the way that other works of art do. Rather than simply tell the viewer what they are about, they appeal to the parts of the brain that can’t be controlled as the viewer tries to make sense of them.